It’s been exactly one year since Twitter went public, and since that time, the company has more than doubled its revenue to $US361 million … but its losses have also widened to $US175.5 million, and the company’s stock is currently 9% below its first-day closing price of $US44.90. 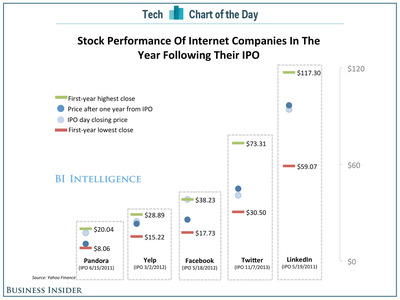 Despite the level of scrutiny Twitter faces from investors (that’s also because it’s either lost or replaced five product heads in as many years), the company is still pretty far ahead of other prominent internet companies that have gone public in recent years. Based on Yahoo Finance data charted for us by BI Intelligence, Twitter’s stock has achieved higher highs — and even higher lows — than Pandora’s, Yelp’s, and most importantly, Facebook’s, the social network with five times as many users. 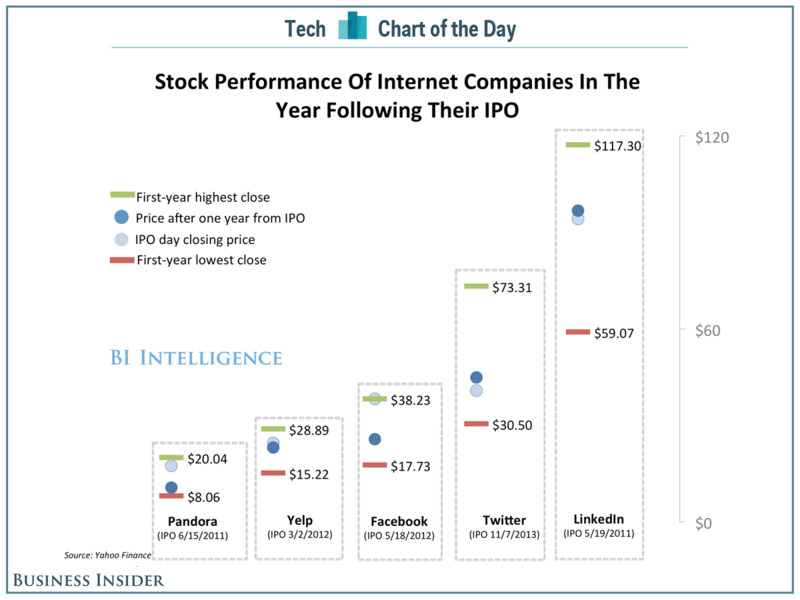 LinkedIn is the standout internet company that managed to achieve much higher closing prices across the board in its first year on the NYSE.